Soon after George W. Bush took office, David Orr was asked to join a presidential committee aimed at improving environmental policies. They wanted the Oberlin environmental studies professor because he was considered a quote “sane environmentalist.” The group’s recommendations were supposed to be presented to Administration officials in September 2001, but after the 9-11 terrorist attacks, committee members felt their report was shelved. But Orr says the Bush Administration and much of the nation weren’t ready for that message. People felt the need to retaliate against Osama bin Laden and Al Qaeda. Many political analysts also agreed with President Bush, that the United States had an important role to play in ousting Saddam Hussein in Iraq. But Orr believes the U.S. invasion of Iraq was less about terrorism than it was about America’s need for Middle East oil. Orr says reducing U.S. dependence on foreign oil would make the nation more secure than spending billions of dollars in military costs to fight for those oil reserves. Some lawmakers say reducing dependence on Middle East oil is one reason to drill for oil at home, in places such as the Arctic National Wildlife Refuge. But Orr says political leaders and citizens should instead find ways to use less oil and reduce the need for it. He says the federal energy bill should force automakers to build cars that get better gas mileage. Instead of trying to encourage fuel efficiency, Orr says Congress is thinking about short-term answers. With the price of gas at the pump more than two dollars a gallon, the Senate recently approved a tax break package to encourage further domestic oil and gas production. Orr wants consumers to push for energy alternatives, rather than finding more places to drill, but Americans like their big SUVs, and Orr says few politicians would risk asking them to forgo the comfort, luxury, and perceived safety of big trucks as a way to preserve energy for future generations. Orr says even if you don’t mind paying the price at the gas station, there are higher costs we’re paying for oil consumption. officials along the rail route. Brendan Hoffman is with Public Citizen. whole concept of having an open government and accountability and transparency. this longing, this weight in my bones; it’s of design. grandfathers and daughters, friends and strangers. take personally their orchestrated, surgical destruction. certainty is an imperfect expression of the human condition. carefully to a different kind of honesty – to joy, to pain. they add up to war. small and delicate holding so much in that tiny, beating heart. crickets. Smell the soft skin of your son’s cheek. Peace is true. And I am a woman who wants peace. It’s not a whim; it’s of design. Host Tag: Julia King lives and writes in Goshen, Indiana. She comes to us by way of the Great Lakes Radio Consortium. Some federal agencies and laboratories have restricted access to information. The government fears terrorists could use some information to plan attacks against the U.S. Following the terrorist attacks on September 11th, the federal government has been re-thinking its website policies. Anything that the government feels could be used by terrorists was removed from the internet. For example. 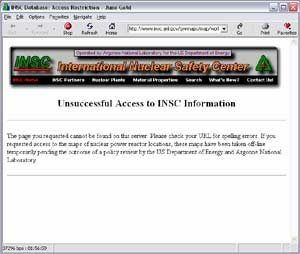 the Nuclear Regulatory Commission completely shut down its website for a time and little of it has been restored. The Army Corps of Engineers removed information about dams across the U.S. from its sites. Similarly, some information about natural gas pipelines, and transportation systems was removed. The Environmental Protection Agency removed information about hazardous chemicals. Now, the EPA is considering putting back some information about the risks communities face because of nearby industrial plants. But, some industry groups were glad to see the information removed and don’t want it put back on the internet. The Great Lakes Radio Consortium’s Lester Graham reports. In the last decade or so, the government has put volumes and volumes of information on the internet. In the interest of an open and free government, federal agencies have given the public access to all kinds of data. But after the terrorist attacks, there was a scramble to remove a lot of that data. Some government agencies concede they might have overreacted when pulling information off the web. But, most indicate they thought it was better to be safe than to leave information on the internet that terrorists could use to more effectively plan an attack. For example, the Environmental Protection Agency removed Risk Management Plans from the EPA website. Those plans give details about certain hazardous chemicals that are kept at industrial plants, how a chemical leak or fire at a plant would affect the surrounding community. and even how many people might be hurt or killed in a worse case scenario. The EPA Administrator, Christie Whitman recently explained to journalists why she had the agency remove those plans. The information was originally put together in EPA office reading rooms open to the public. Later it was put up on the EPA’s website. That was so community groups could more easily learn about the risks they faced from nearby chemical plants. It was also used by some neighborhood groups to pressure companies to either implement better safety measures or stop using certain chemicals. Administrator Whitman says in the weeks since the attacks, the EPA has been reviewing whether some of that information can be restored to the internet. But many chemical companies and other industry groups don’t want that information put back on the government’s websites, even though it’s sometimes still available elsewhere on the internet. In fact, they don’t want the information available to the public at all. Angela Logomasini is with the Washington-based libertarian think tank, the Competitive Enterprise Institute. She says the information, such as worse case scenarios, shouldn’t be available because it might be used by terrorists. Logomasini was surprised to learn the EPA Administrator is considering putting the information back on the internet. Logomasini says the risk management plans are of little use to the public anyway. She says the only people who used them were environmentalists, who wanted the information to scare people. There’s some skepticism about the chemical industry’s real motivation to keep the information out of public view. Besides environmentalists. Some journalists use the information to track industry safety and government regulations. Margaret Kriz is a correspondent for the National Journal where she writes about government, industry and the environment. She says since September 11th, chemical industry people might be arguing that the risk management plans should be kept secret for national security reasons. But before then, their reasons had more to do with corporate public relations and competition. So, it appears to at least some observers that the chemical industry sees the concern over terrorism as an opportunity. an opportunity to get the internet-based information removed for good. But it looks as though the Environmental Protection Agency is leaning toward making some of the information available on the website again. However. EPA Administrator Christie Whitman didn’t say when. Other agencies are also reviewing the information they’ve removed from the web with an eye toward eventually making some version of the data available to the public once again on the internet. What information has been taken offline since September 11th? Before the terrorist attacks on the U.S., environmental groups were often critical of the Bush Administration’s policies. But, since September 11th, most of the environmental organizations have erased all traces of criticism of the White House. Some politicians, though, see opportunities to push through energy policies in the name of national security, policies that could damage the environment. The Great Lakes Radio Consortium’s Lester Graham reports. If you’d visited the Sierra Club Internet web site before September eleventh, or that of the Natural Resources Defense Council, or any of a dozen or more major environmental groups’ sites, you likely would have seen sometimes harsh criticism of the Bush Administration’s energy policies, environmental policies, and a host of other complaints the groups had against the White House. Some environmental groups were also running TV ads attacking the Bush Administration’s policies. But, after the terrorist attacks, the ads were pulled and many of the environmental groups removed those criticisms from their web sites in the name of national unity. Joe Davis is editor of a tip sheet compiled for environmental journalists. He’s watched as most environmental groups have stifled their criticism since the attacks. Some journalists have questioned whether the environmental groups are backing down from their positions or merely lying low for a little while. The environmental groups aren’t saying much. But behind the scenes, there’s concern that environmental protection will get trampled in the name of national security. Meanwhile, some politicians have seen opportunities in the wake of the tragedy. Immediately after the attacks, the Alaska congressional delegation began pushing harder for oil drilling in the Arctic National Wildlife Refuge. The members said such drilling would reduce America’s dependence on oil from the Middle East. They were admonished, though, for being opportunists in the wake of tragedy. The Alaska politicians quickly backed off and took the fight for drilling behind the scenes. Outside of Washington, it’s a different story. Some state politicians have become even more vocal in their support of oil and gas exploration. Just before the terrorist attacks, Michigan’s Natural Resources Commission lifted a moratorium on drilling for oil and natural gas under the Great Lakes. The Michigan Legislature could still step in to block any such drilling. But some of the lawmakers say because of the terrorist attacks, Michigan should drill. Dale Shugars is a Republican State Senator who supports drilling under the lakes. Environmentalists in Michigan are appalled that Senator Shugars and some of their colleagues are taking that tact. James Clift is the policy director for the Michigan Environmental Council. He says the reserves under the lakes are so miniscule they’ll have next to no effect on the nation’s energy security and using the terrorist attacks to justify drilling under the Great Lakes is wrong. But Senator Shugars thinks it is naïve to believe using less fuel will be enough. He says now that we’re at war with terrorists, it’s important to drill for fuel for the military and needs at home. Senator Shugars and others using the terrorist attacks to justify the energy and environmental policies that they want might be walking a tight rope. History shows Americans tend to frown on opportunism during times of national crisis. Environmental journalist Joe Davis says if politicians and energy industry leaders do use that approach, it could backfire. Especially since environmental groups are being quiet for the sake of a united patriotic front. But for now, most of the environmentalists are not saying much – at least publicly – about their opposition to the government’s energy and environmental policies. At least not until the nation begins to get past the shock of the terrorist attacks on the U.S.
Will Environment Be on Back Burner? 11th will hurt the environmental movement. The Great Lakes Radio Consortium’s Jonathan Ahl reports. Munice, Indiana. He says the reaction to the attacks could lead to bad decisions that would devastate the environment down the road. Lowe says one example is drilling for oil in the Arctic National Wildlife refuge. He says national security interests may push for that now, even though it will be damaging in the long run. For the Great Lakes Radio Consortium, I’m Jonathan Ahl.